Until the invention of some sort of teleportation machine, businesses and individuals will rely on a courier business to deliver their messages, packages and parcels. Starting a courier company is actually a very accessible business opportunity with a very low barrier to entry – find out more below. All you need is some vehicles and willing workers; or you could be a lone self-employed courier. According to IBISWorld’s Postal & Courier Activities – UK Market Research Report there are currently 17,724 courier businesses operating in the UK, employing more than 258,000 people. The industry is worth £21bn and has seen 0.8% growth from 2013 to 2018. The report suggests that the ongoing growth in online shopping will contribute to significantly increased revenues from parcel delivery. So, whilst it’s an increasingly crowded industry, there’s no shortage of business. Amongst the “success factors” IBISWorld identifies for postal and courier businesses are the ability to adopt new technology, development of new products, and accessibility to consumers and users. Sound like the business opportunity for you? Here’s your guide to setting up a courier business. Click either option to get quotes today! Alister Nightingale is the founder of Doncaster-based courier company ANDS Ltd, which operates a fleet of four vehicles from a warehouse base and employs 10 staff. Bicycles are ideal for a city centre courier business as they are one of the fastest ways to get around in an urban environment. They can take routes that vans and motorbikes can’t and are much cheaper to run, relying on human power rather than petrol. They also don’t require the same insurance costs vehicle taxes and maintenance costs. Cycling is widely held to be the most efficient means of self-powered transportation. Being people-powered however, long distances are inadvisable and would be better covered on a faster means of transportation. Whilst the motorbike can’t beat the bicycle for urban access, on a straight it’ll easily beat it for speed. If your courier business needs to cover big distances fast, a motorbike could be the option or you. They also have the advantage of being able to carry larger packages. For larger parcels and longer distances, a van is going to be your best shout. As you can transport more than one large parcel on a single trip, you can economise by delegating multiple jobs in the same area to one vehicle. Some jobs have particular needs, and require a specialist courier service. This could be the need for safety or sensitivity, or for delicacy (very fragile goods). Temperature controlled – this could be chilled or frozen food or liquid nitrogen temperature controlled medical or pharmaceutical goods. Pitching your courier business at one of these specialities is a good way to set yourself apart in the crowded courier market and drum up more business. 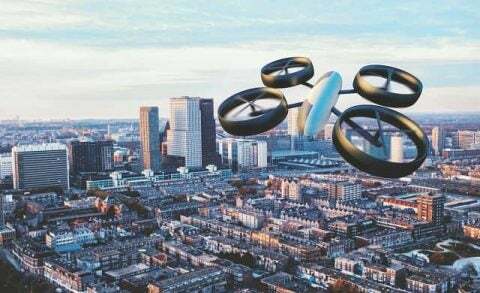 There’s no quicker route than as the crow flies and drone delivery services are becoming a reality. Amazon is already in the process of testing its drone service, Amazon Prime Air, at development centres in the UK, US, Austria, France, and Israel; awaiting regulatory approval for a full launch. The world’s first drone delivery service launched in Reykjavik, Iceland in 2017, delivering food and other goods across the country’s capital. Why not get ahead of the game and start investing in your own challenger drone delivery service. Projects already under way claim to be not just much faster than road services, but much cheaper to run as well. Think carefully about what you want to achieve with your courier business. You could have a fleet of different vehicles to suit different jobs, though this will result in significantly higher start up and ongoing costs. Determining your target market when researching your business plan will help you establish what kind of need there is in your area and what kind of vehicle you need. If you don’t want to do the legwork of setting up a courier company you could just buy an existing one. This gives you an established customer base and brand image to build on. BusinessesForSale.com lists a number of courier and despatch business opportunities for sale across the UK. They range from around £28,500 to more than £350,000 depending on their facilities and turnover. Make sure to do your due diligence on any business you’re interested in buying to see if the figures add up. Establish their reasons for selling the business before committing. A quick Google search can bring up a wealth of valuable information about a business you might be interested in buying including how it ranks in search results and any good or bad publicity. Alternatively you could think about joining an existing courier franchise. A business plan isn’t just the blueprint for your business, it’s the document that’s going to help you secure investment and act as a guide through those rocky early months and years. You don’t have to be a slave to the business plan – circumstances change – but you can hit the ground running with much more confidence if you know where you’re going. The business owner – what’s your previous employment history? Any other business endeavours? What skills do you have that will lend themselves to managing a courier operation? The business – what differentiates your courier company from all the other courier companies that exist in the world? The service – details of how your courier service will operate and its pricing strategy. How will it be scaled up? The market – what is the demand for a courier service in your area and how many customers could your business potentially reach? Who is the typical customer of your business? Strengths, weaknesses, opportunities and threats – what makes your courier business better than other services? What makes it weaker? What are the main threats for your courier business and what are the opportunities? The competition – thoroughly research the other directly competing courier businesses in your area to see how you compare and could improve on their offering. Nightingale who drew on his career in logistics to make sense of the local courier market and identify a niche he could exploit, says “research is vital as the courier business can be quite competitive”. You don’t need to feel like you’re going it alone. Nightingale received help and advice through the Sheffield City region Launchpad programme from an experienced advisor. There are many such organisations across the country that can help you with the more complicated areas of your business plan. According to the ANDS founder, they encouraged him to “prepare a cashflow forecast for the business and formulate my growth plans. I was advised to consider lots of different scenarios – for example, understanding my survival budget – the minimum amount of money I needed to run my business.” Be aware that you may need to watch your cashflow particularly carefully if you allow customers to pay by invoice (factoring can be one way to offset gaps in cashflow caused by unpaid invoices – you can evaluate factoring fees and the process here). Nightingale says you should also consider “what-if scenarios” such as how an increase in petrol prices might affect your courier business, how much time it takes to make deliveries. “What would happen if a vehicle is involved in an accident and you’re off the road. You’ve got to think ‘plan A’, ‘plan B’ and ‘plan C’”, he urges. As mentioned above, a courier operation can be a very accessible and relatively lean start-up model. A self-employed cycle courier, for example, just needs a bike and a few other cheap items such as a decent phone (you might want to consider business phone contract options) to get going. A courier service using vans can expect to pay more in start up and ongoing costs (see the best small van for courier work section below). Whether you’re a lone self-employed courier or you operate a fleet, having a uniform shows professionalism and creates a recognisable brand that could help you find more business. This could be as simple as a printed t-shirt or a full, branded uniform. “The biggest single outlay is acquiring a vehicle”, says Nightingale. Your vehicle must be fit for purpose, but it’s also important to remember that the vehicles you use depend on the type of service you are planning to deliver. For example, large vans would be impractical if you’re planning to do lots of short drops, whereas motorbikes may offer a more suitable alternative. That said, it depends on the type of goods you are planning to transport. Larger vans can offer some advantages, enabling multiple drops of larger items to be made. The size and nature of your cargo will dictate the small van you choose for your courier service. You may also want to consider the reliability and fuel economy of your chosen van. Launched in 1996, the Citroen Berlingo has endured as a popular small panel van for commercial use. Now on its third generation, the Berlingo was one of the first vans to offer a collapsible passenger seat for long items. It comes in two body lengths depending on your needs. A functional and versatile small panel van with a high load capacity. Available in two models depending on the size of loads you need to carry: the Caddy and the Caddy Maxi. Launched in 1995, the Mercedes Sprinter is one of the most well-known large commercial vans. Now on its third generation, the van has topped the Fleet News’ FN50 reliability survey for three years running. The newest Sprinter can operate in front-wheel, rear-wheel, or all-wheel drive and is available in two engine variants: 163hp, and 190hp. After the initial cost of your bicycle, motorbike or van, you’ll have to factor in ongoing costs such as maintenance, insurance and petrol for the latter two. Include these in your business plan. As the business grows, you may need to invest in an office, but initially this is something which isn’t strictly necessary. Finding a roster of customers who need regular repeat deliveries is the best way to ensure a sustainable income. As long as you maintain a high level of service you can have a lasting and mutually beneficial relationship with your customers. Local small businesses are a great place to start, especially ones that rely on a high volume of materials to be delivered regularly. If they already have a courier delivery partner, make them a better offer. Check on local market rates and charge a reasonable price for your delivery services. You could start lower than the going rate until you have built up a loyal customer base. There are a number of different web platforms which help drivers to secure work, this has proved to be invaluable in getting know new customers and developing business contacts. According to the government’s National career service, couriers can expect to earn between £14,500 a year and £40,000 a year depending on experience. You or your drivers should have a full UK driving licence. Good vehicle tracking software is the foundation of a slick and customer-centric courier business. Business vehicle tracking software allows you to track your fleet so you can monitor everything from routes to speed and arrival times, and even make sure they are taking adequate breaks. View a breakdown of vehicle tracking costs and compare prices here. When you’re ready to move on from your courier business and deliver it into the hands of a new owner, there are plenty of places to sell a courier business online. Whether you sell to an individual looking to start out in the industry or a courier business expanding through acquisition – nationwide CitySprint has acquired and integrated more than 24 courier and distribution businesses since 2010 – buyers will want to see an established client base, strong revenues and good growth potential. Back this up with genuine figures and you’re away.